A couple preliminary questions: Is the reference to "that ancient serpent" an allusion to the snake of Genesis 2? And is the "Satan" an allusion the satan of Job/Zechariah/Chronicles? Then, assuming the answer to those two questions is yes, was John the first to link these two figures together? Or had the two already been connected in Jewish thought at the time? If not, is there any way to explain how the two became linked in John's mind? The Hebrew noun satan, along with related nouns and verbs, are semi-common in the Hebrew scriptures. These terms are used in a variety of contexts and refer to a variety of individuals. In Numbers 22.22,32, for example, it is an angel explicitly acting on God's behalf who is identified as a satan, meaning 'adversary'. In 1 Samuel 29.4, it is David who is identified with the word. In other passages the 'satan' is a human acting as an opponent (2 Samuel 19.22; First Kings 5.4; 11.14,23,25). In yet another, the term satan describes an accuser in a court setting, who stands to the right of the person being accused (Psalm 109.6). During the Second Temple period (538 BC and after) we see a development in Jewish theology concerning angels. Several books begin giving names to angels, elaborating on their roles in their service before God (e.g. Raphael in the book of Tobit; Gabriel and Michael in the book of Daniel; many more in 1 Enoch). This included an expanded understanding of a specific angel who acts as an 'accuser' (satan) in the heavenly court setting. Zechariah 3, written c.520 BC, describes the satan as standing to the right of the high priest Joshua in order to accuse him, just like we find in the court setting of Psalm 109.6. It is worth noting that in both passages, it is implied that the satan is doing wrong: Psalm 109.6 makes the satan parallel to 'a wicked man', and in Zechariah 3 the satan is 'rebuked' for his accusation against Joshua. The book of Job, which is generally dated to the 6th-4th centuries BC (contemporary to or later than Zechariah 3) has the satan again appearing in the heavenly court. Here he is not explicitly 'evil', but he is associated with tempting humans to sin, and he inflicts trouble and pain. In 1 Chronicles 21.1, written about the middle of the 4th century BC, the editor has changed 2 Samuel 24.1, so that instead of God himself inciting David to sin, it is satan who has done it (probably, like in Job, at the instruction of God). The lack of a definite article in Hebrew is often cited as evidence that 'satan' has transitioned from a descriptive label into a proper name, but this claim is not necessary; earlier uses of the word lack the definite article as well when 'satan' is clearly not intended as a proper name (1 Kings 5.4 and 11.14,23,25 all lack the definite article). Even before the Revelation was written, different Jewish authors from a variety of traditions were associating the satan with the serpent. Life of Adam and Eve identifies 'the devil' as the one who deceived Eve, whether by speaking to her directly, or by using the serpent as a mouthpiece. First Timothy 2.9-15, during instructions of how women should dress and behave, mentions Adam, Eve, and women being deceived. When the author later gives additional instructions to women in 5.9-16, he again closes the section by mentioning women being led astray, this time mentioning 'the adversary' and 'the satan'. The parallelism between the two passages implicates the satan in the deception of Eve in Genesis 3.1-6,13. The context is specifically about deception (Romans 16.17-19), so conceptually we are in the same realm as Genesis 3.15: a deceiver being crushed under foot. So while the Greek text of Romans 16.20 does not use the same verbs or nouns found in the Septuagint version of Genesis 3.15, it is still possible this was the intended background to what Paul wrote. In this case it is not 'the satan' who is identified as the deceiver of Eve, but it is certainly an angelic figure who sinned in the ancient past (the context is an elaboration of Genesis 6.1-4). It should be noted the book of 1 Enoch is not consistent in its portrayal of angels; it is a compilation of several separate Enochic texts, all of which have undergone some degree of editing. Another part of the book refers to the wicked becoming 'servants of Satan'. No explicit mention is made of the serpent, but the author certainly has the early chapters of Genesis in mind. Immediately before saying 'through the devil's envy death entered the world', the author mentions that humans are made 'in the image' of God, a concept found in Genesis 1.26-27, 5.3, and 9.6. Given the above, the Revelation is entirely in line with existing Jewish thought when the author (a) identifies the satan as the primeval enemy of God and humanity, and (b) identifies the satan as the serpent in the garden of Eden. was John the first to link these two figures together? Or had the two already been connected in Jewish thought at the time? If not, is there any way to explain how the two became linked in John's mind? In fact, Serpent themes and their association with Evil appear in nearly all creation myths of the Middle East. No where is this association as striking or old as the myth of Apep arising from Egyptian Mythology from Sun Temple to Ra at Heliopolis. I know that mountain of Bakhu upon which sky leans. ... On the east of that mountain is a serpent, 30 cubits in his length, with three cubits of his forefront being of flint. I know the name of that serpent who is on the mountain. His name is "He overthrows". Now at the time of evening he turns his eye over against Re, and there occurs a halting among the (solar) crew, a great astonishment(?) within the voyage, so that Seth bends himself against him. my companion is the uraeus-serpent, who comes forth from the god, the ’i‘r.t-serpent, who comes forth from Rē‘. To say: Thy act is against thee, what thou doest is against thee, O sksk-serpent, which is in his (thy) hole?, the opponent. 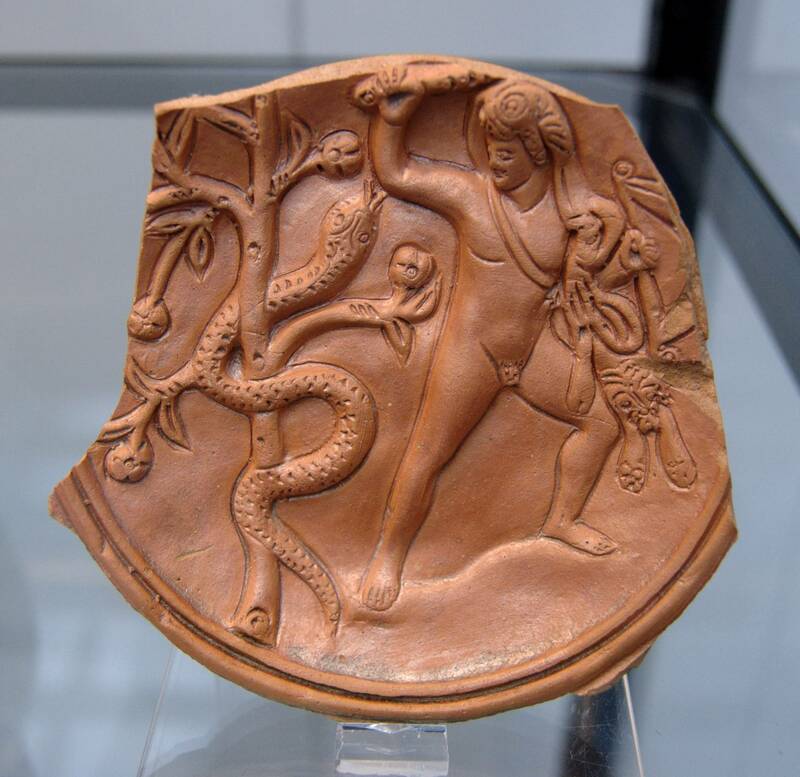 To say: He (serpent) whom Atum has bitten has filled the mouth of N., while he wound himself up (lit. wound a winding). To say: Hki-serpent or hkr.t-serpent, go away (with) face on the road. Eye of N., look not at him. Thou shalt not do thy will with N. Get away. These references at the Pyramid of Unas make Apep the serpent among the oldest recorded legends in antiquity (2494-2345 BCE). 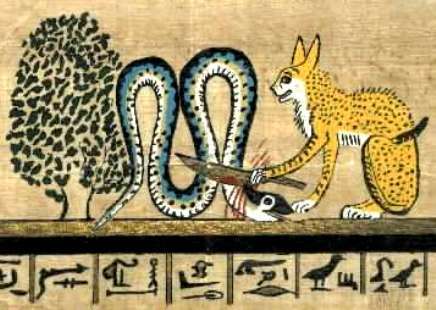 Furthermore, Apep is heavily associated with the Tree of Life. 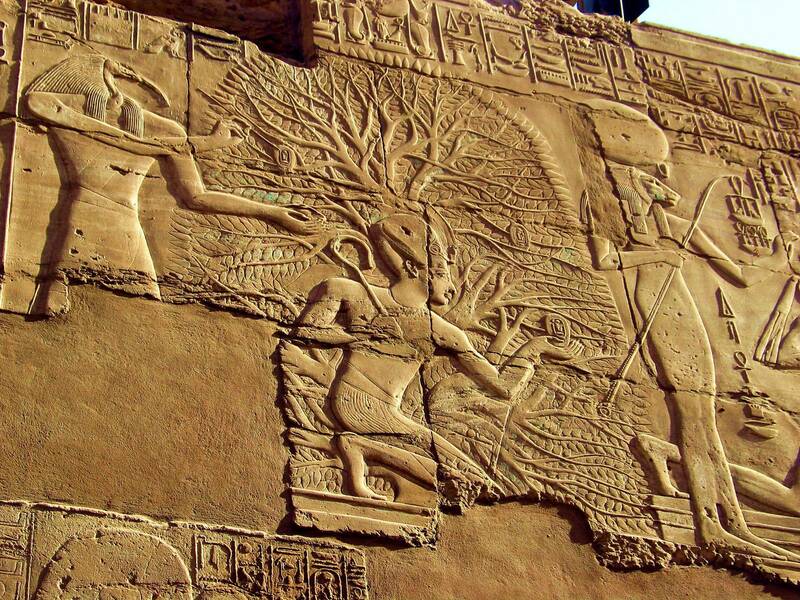 In the Sun Temple to Ra at Heliopolis, there was a Tree (the Ished Tree) which appears to have been the Tree of Life. 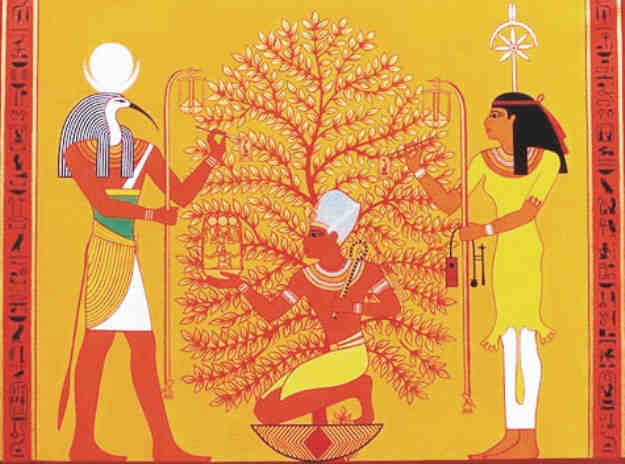 They give to Pharaoh Pepi II the tree of life whereof they live, that Pharaoh Pepi II may, at the same time, live thereof. I am the Cat which fought by the Persea tree hard by in Annu, on the night when the foes of Neb-er-tcher were destroyed. What then is this? The male cat is Ra himself, and he is called Maau by reason of the speech of the god Sa [who said] concerning him: "He is like (maau) unto that which he hath made, and his name became Maau"; or (as others say), It is Shu who maketh over the possessions of Seb to Osiris. As to the fight by the Persea tree hard by, in Annu, it concerneth the children of impotent revolt when justice is wrought on them for what they have done. As you can see from this, the serpent was not unique to Christianity or related to evil/the adversary in just the Jewish mind, but all of the Levant. 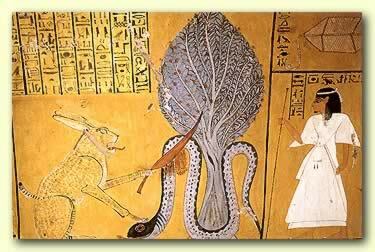 The serpent had, for many years been associated with not just evil and the Abyss/Underworld, but Also the Tree of Life (such as the one in Revelation 22:2 and in the first 3 chapters of Genesis). Thus this myth can be traced from the oldest known mythology to Greco-Roman mythology during the time at which John would have been writing Revelation and could explain how these were connected in in his mind (and all of Mesopotamia, really). It also makes it clear that he definitely was not the first to link the three. † According to the Coffin Texts and the Bremner-Rhind papyrus, Ra's Sole Eye returned from searching for shu and tefnut to find that it had been replaced in its' absence. It became upset and turned into Apep. Here is an interesting perspective I found in regard to this. The Hebrew word rendered "serpent" in Gen. 3.1 is Nachash (from the root Nachash, to >shine), and means a shining one. Hence, in Chaldee, it means brass or copper, because of its shining. Hence also, the word Nehushtan, a piece of brass, in 2 Kings 18:4. Thus he sees Satan as the "shining one" of Genesis 3, also referred to as the "angel of light" in 2 Cor. 11:3. There is much more to it, all very interesting which you may read about directly. The link to Bullinger's Companion Bible has the appendix listed at the bottom of the list. One has to use the arrows at the top of the list to then navigate page by page until reaching appendix 19. Not the answer you're looking for? Browse other questions tagged genesis revelation historical-interpretation job satan or ask your own question. In Job 41:5 is it cynical of God to mention the young women in his house if they are already dead? Was God's motive for barring man from eating of the “tree of knowledge” as given by the serpent true?